CAMBRIDGE — Doug Taylor used to get to work the way most Americans do, driving alone. Then he switched jobs to one of the many Kendall Square companies that offer financial incentives for employees to leave their cars at home. After trying the commuter rail, the 48-year-old Medford resident soon discovered he could pocket even more by biking. Though Taylor had not owned a bicycle since high school, he now pedals 12 miles most days, taking the T occasionally, driving rarely. Taylor is part of a set of statistics so surprising it looks like a mistake. ­Despite the rapid expansion in and around Kendall Square in the last ­decade — the neighborhood absorbed a 40 percent increase in commercial and institutional space, adding 4.6 million square feet of development — automobile traffic actually dropped on major streets, with vehicle counts falling as much as 14 percent. Although more commuters are churning in and out of Kendall each day, many more than ever are going by T, bike, car pool, or foot. “As someone who has actually lived and worked here all that time, I can tell you, it’s true,” said Tim Rowe, founder and chief executive of the Cambridge Innovation Center and president of the Kendall Square Association. Consider One Broadway, where the innovation center spans seven floors. In 2000, it had just one simple bike rack. Now, it has an electronically locked indoor cage and three indoor racks; outside, the city added sidewalk locking posts and reclaimed automobile parking for on-street bike racks, all of which are often full. The trend has challenged longtime assumptions by developers and neighborhood advocates about the amount of parking and traffic a new building needs and generates. “When you look at what’s happened with traffic, it has not been the scary scenario that people feared,” said Assistant City Manager Brian P. Murphy, Cambridge’s community development director. Part of the credit goes to broad trends: higher gas prices; the growing popularity of biking; the increasing number of professionals, especially in ­Kendall’s “knowledge economy,” who want to live in urban areas and do not need to drive to work. But the shift from driving in Kendall Square is about more than the luck of location and transit access. Since 1998, the city has required commercial and institutional developers who add parking spaces to active­ly discourage people from using them. The policy is supported by statistical targets and annual monitoring, tools that have made Cambridge’s Parking and Transportation ­Demand Management Ordinance not just a pie-in-the-sky resolution but a case study ­examined by local and national planners. In Cambridge, any developer who builds or expands a ­garage or lot and winds up with at least five parking spaces must pick from an array of ­options to encourage greener transportation, from subsidizing MBTA passes, charging ­employees to park, and underwriting a shuttle that supplements the T, to offering bike tune-up days, building locker rooms and showers, and guaranteeing an emergency ride for those suddenly needing a car. Developers with at least 20 spaces must meet city-set goals aimed at reducing the percentage of workers who drive. At Ironwood, where the target is 50 percent, employees get $100 a month toward commuting costs. If they drive, they can apply it to the $220 a month they pay to park. If they take the T, they can spend it pretax on passes ordered through the company. They can also board the EZRide, a bus paid for by employers and workers that connects Cambridgeport, Kendall, Lechmere, and North Station, eliminating indirect subway connections for commuter rail riders. It has grown from 200 to 2,500 daily riders since 2002. And the employees keep whatever remains of their $100-a-month subsidy, a sum that adds up for cyclists like Taylor. Those choices helped Ironwood reduce its drive-alone employees to 41 percent last year, down from 50 percent in 2007. When Novartis moved into the renovated Necco candy factory in 2004, the city set its driving target at 44 percent, meaning the company had to persuade more than half its workers to use other modes of transportation. For those who drove, the pharmaceutical giant built a 350-space garage, but planned to use stackers to park more in double-decker fashion, said Susanne Rasmussen, Cambridge’s director of environmental and transportation planning. Even with 1,200-plus employees there, Novartis, which provides up to $125 a month toward T passes but charges $250 for parking, has never needed the stackers. Just 33 percent of employees drove alone last year. Though the city can impose fines and even shut down parking at workplaces that fail to comply, it has never needed those tools and only rarely must apply pressure to ensure compliance, said Stephanie Groll, manager of the Cambridge program. Green-commuting benefits have become woven into the workplace culture of Kendall, offered even by companies not covered by the ordinance. Companies have a vested ­interest in preserving the qualities that make Kendall attractive to employees, given its emergence as a vibrant, walkable neighborhood with amenities, said Stephanie Pollack, ­associate director of Northeastern University’s Dukakis Center for Urban and Regional Policy. “If you work on [Route] 128, you have to get in the car to go get something to eat or go to the gym, and you don’t do that in Kendall,” Pollack said. With high demand to locate in Kendall, the next test will be whether Cambridge can turn up the dial on the ordinance to invite even more development without clogging traffic. The power may be out of Cambridge’s hands. The ­MBTA’s financial woes limit its ability to meet bus demand in Kendall and to invest in upgrades to an antiquated Red Line signal system that limits the frequency of subway trains. So a new kind of congestion — waiting for the T, jostling for position in bike lanes — is supplanting traffic worries, which officials call a good problem to have. 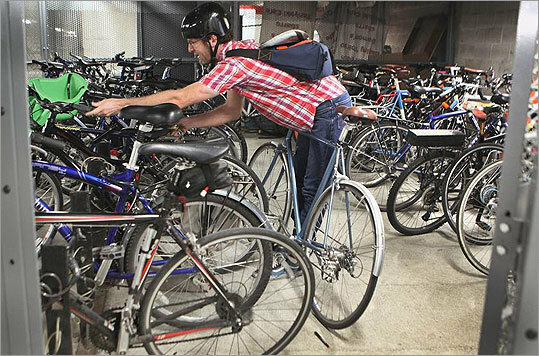 At the Broad Institute, where 24 percent of employees drove alone last year, scientist and veteran cyclist Mauricio Carneiro, 32, of Charlestown said he is having a harder time finding bike parking. And as more people toggle between the T and bicycling, depending on the weather, Carneiro is navigating among newcomers. “In the summer, we’ll get really crowded with bikes,” said Carneiro, whose benefits include $20 a month to spend on bicycle expenses such as inner tubes and helmets. But he wouldn’t think of driving.